Note: This is a bilingual post, feel free to skip the language(s) you do not understand. Basically, AK, a Taiwan well-known blogger started a "Hit Pan Award/Empties" series on her blog 5 years ago, before the whole empties craze hit the blogosphere or youtube. I love reading AK's blog and her readers' empties entries, so I had to enter this year too! If you read Chinese or are interested in Asian products, go to check out this series of hers (link), or her blog (link)! Melvita, Narcissus Extraordinary Water - Hurray - My skin feels and looks at its best while I was using this as my toner + serum. It smells more of the stems, instead of flowers, and has all the good natural botanical ingredients in it. 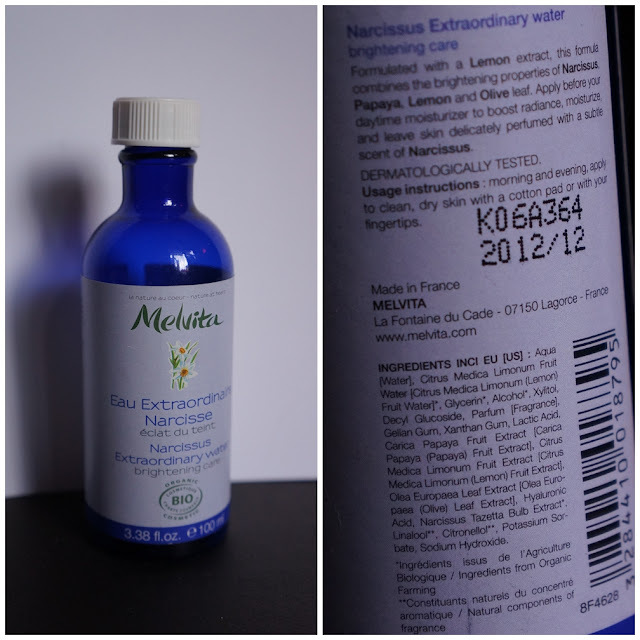 (If you have been following me for a while, the Naruko Narcissus line that I also love is more like floral-scented than 'stem'...) The Melvita leaves skin very fresh but hydrated. I can see my skin glowing within a week! Huge downside, this little bottle won't last long. I applied it with cotton pads, as it is too runny to use with hands/fingers. One bottle with day and night consecutive uses can only last a month or two for me. Very expensive indulgence for a bottle of water/skin care! However, compared to the also very expensive Cle de Peau skin care, this is more worthwhile. Now I'm wishing really hard that I will receive this as Christmas present again. Champneys Spa Treatment, Skin Comforting Body Butter - Hurray - I have not yet technically finish this tub. How could you finish such a tub within a month? (I bought this in early Nov.) I guess I have used about 1/10 of it? The reason it is in this post is because the tub cracked after I dropped it onto the floor... So I had to transfer the content to another container... It smells delicious, sweet, creamy, vanilla-ish, comforting - fabulous. The texture is a more like thick cream than hard butter, delivers much moisture and keep skin soft to touch and great-smelling overnight. Essence, Express Dry Spray - Okay - I got this from a beauty swap with an Italian lady. This helps nail polish dries faster. I enjoy using this up, and it delivers results. However, I can't use this in my tiny room (bad ventilation), and I prefer the dropper-oil type of fast-dry products. Naruko, Rose and Botanic HA Aqua Cubic Makeup Removing Oil Cleansing Oil - Okay - At first I really hated the scent - link to initial review - but after using up the whole thing, I quite like it. It removes make up very effectively, leaves skin moist but not greasy. I won't buy it individually again though, as the key ingredient is mineral oil. I am 'neutral' on mineral oil, only complain is it is the cheapest filling/base ingredient in cosmetics, so I find it not justified for the $. I will, however, repurchase if this cleanser comes in a set though - which Naruko often does. Neutrogena, Extra Gentle Cleanser - Okay - I use this with my Clarisonic. Non-foaming, creamy moisturising cream wash. Like this a lot. Celdie, Rosehip Cleansing Cold Cream - Hurray - Holy Grail that is sadly discontinued. (I made up the name myself as I'm illiterate in Japanese.) Smells divine, feels luxurious to use on the skin despite being only hkd $25 (usd $3). Their foaming face wash are quite drying so I can't get those even though they make Rosehip scent also... Too bad. VO5, Hot Oil - No Way - A pre-shampoo treatment of some sort. Doesn't nourish much, nor does my hair need that high maintenance anyway. Bath and Body Works, Coconut Mango Body Lotion - Okay - A very summery scent. The coconut trace reminds me of my favourite cocktail Pina Colada. The mango is definitely there, too. A sweet scent that totally screams Summer, beach and sunscreen (or sunbathing) to me! Eternal Concept Mud Hair Mask - Okay - I got this in one of my Glamaboxes. I used it in three washes, twice as a hair tips conditioner, and once as a scalp massage. I like it, but I couldn't tell any big difference it has made on my locks. Nubar, Foundation Base Coat - Hurray - One of the few nail base coats that I love. I find this pretty similar to the OPI Natural one (also has a faint pink tint in the bottle). Punky, Candy Night Mask (Lemon Verbena) - Okay - Nothing special really, not particularly moisturising nor de-stressing (their claims) nor anything. Cosme Decorte, Moisture Liposome - Okay - Magazine freebie. Decent stuff but I won't be getting this at its full price. Feels like normal mositurising serum to me. BRTC, Aqua Rush Cream - No Way - Got this tube with a BB cream set, however, despite madly in love with BRTC's various BB cream, this cream sxcks. It feels like dried up sleeping mask in a tube, suffocating and not moisturising. Natio Men, Daily Face Wash - Okay - Used this up as a shower gel for my back acne. Doesn't worsen the situation, smells very manly/cologne-ish, refreshing. Nuxe, Gentle Exfoliating Gel with Rose Petals- Okay - I adore the scent and natural exfoliating particles, but not the gel texture it comes in. Divinia, Moisture Cleansing Wipes - Okay - Basically I only like wipes to remove the 1st layer of dirt or melted make up when I got home, I always double cleanse with make up remover and cleanser in the shower. This Divinia offering is pretty moist, decent sized (I prefer even larger though), not bad. Zelens, Cellular DNA Protection Day Cream - Okay - A lot of British beauty bloggers are raving about the acid exfoliating pads this brand makes, which I have not had the privilege to try out yet. This cream was sent to me by Ari, and I love it. It reminds me of the Dr. Hauschka type of good herbal creams. It is moisturising and my skin did feel protected. Great smell too. La Roche Posay, Toleriane Dermo-Cleanser - Okay - Non-foaming milky cleanser. Great stuff for sensitive skin. Phyto, Phytheol Intense Treatment Shampoo Anti-Dandruff - No Way - I admit I do not have dandruff issue, so in the first place, it isn't formulated for my scalp. I ripped it open to test it just to see if I would like it (so I could purchase it when I might have dandruff issue). This stings. It did leave my hair clean and voluminous (surprise! ), and my scalp felt healthy. However, I cannot stand the pungent fume, so I will most probably purchase other Phyto shampoos in the future. Davines, Love Lovely Curl Enhancing Shampoo AND Davines, Love Lovely Curl Enhancing Conditioner - Okay - I enjoyed the samples when I was on a getaway weekend. Kiehl's Superbly Smoothing Argan Shampoo - No Way - It targets coarse hair which I do not have, but I decided to give this a try anyway. The scent is not lovely; I prefer their other hair product scents, e.g. the amino acid line. It leaves my hair very soft after the wash, but nothing fancy. Kiehl's, Superbly Smoothing Argan Conditioner - Okay - Smells better than the shampoo. I only used this on my hair from the ears down to the ends. Mositurises very well, and leaves hair soft and decent-smelling. Burberry Beauty, Fresh Glow - Okay - Used and revied in this FOTD. Not a must have, but nice to have primer that gives skin an amazing glow. Burberry Beauty, Sheer Foundation - Okay - I prefer something either even more sheerer (and gives skin a healthy finish), or something higher coverage. This is a nice in the middle foundation. Also used and reviewed in this FOTD. Sasatinnie, Cucumber Refining and Clarifying Mask - I will be doing a collective review on a few on these masks, please keep an eye out for those! Providence Beauty, Spotless Oil Control - Review coming! Combos Skin, Tea Tree Balancing Mask - Review coming!